Within the UFZ thematic scope of “Chemicals in the Environment,” studies focus on gaining a better insight into the fate processes like biodegradation, transformation, and the impacts of chemicals under actual environmental conditions, and also on devising novel ideas for assessing environmental chemicals. Chemicals in the Environment Profiler, or CITEPro in short, is the latest technology platform that will currently boost the efficiency and capacity of analysis and assessment of environmental samples and chemicals. Most importantly, this can be achieved by automating the processes involved in chemical analysis, sample preparation; the exposure of aquatic organisms and cell cultures to separate substances; and samples and mixtures from humans and the environment. The UFZ will introduce a research infrastructure at an international workshop to be held on February 6th, 2019. In Germany, this infrastructure is special in the field of environmental sciences. A total of about EUR 4 million has been invested by the German Federation and also by the Federal States of Saxony and Saxony-Anhalt for creating the CITEPro. For years, the dangers of chemical substances posed to humans as well as the environment have attracted a great deal of attention. Repeatedly, individual substances either make the headlines or become the focus of heated public discussions. The present method used for evaluating the hazard potential of chemicals is built on separate substances; however, it is the chemical cocktails, containing large numbers of different molecules, which shape the material world. Hence, researchers have proposed that effect-based techniques like biological effect tests, for instance, should complement the chemical analytical monitoring of water quality, wherever possible. This would subsequently cover all the substances acting together in the cocktails. In addition, these bioassays are at the core of the novel research platform, CITEPro. Instead of being a singular large-scale instrument, the CITEPro contains more than 20 separate instruments that can be utilized in a modular way based on the question under analysis. This consists of units for preparing samples, wherein it is possible to extract, concentrate, and purify the chemical mixtures from environmental samples (for example, from blood or sediment). In addition, high-resolution analytical instruments are available that can be used for determining the concentrations in environmental samples and even in the bioassay multi-well plates themselves, and a variety bioassay techniques are also available for establishing the impact of chemicals on living cells of algae, bacteria, mammals, or entire organisms like fish embryos. The unique aspect of the bioassays utilized in CITEPro is that they are capable of working with a very high throughput. 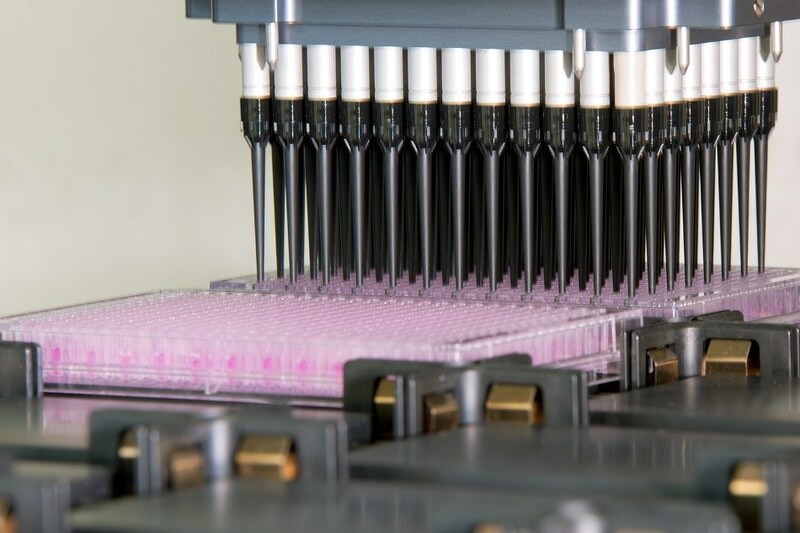 In the case of high-throughput mammalian cell bioassays, pipetting robots have the ability to produce dilutions of environmental samples, chemicals, and mixtures—either as separate samples or complex mixtures with a dispenser that is built on printer technology. As these steps occur in microtiter plates, the amount of samples needed for these bioassays is considerably reduced in comparison with traditional techniques. Once the diluted samples are transferred to the cells dispersed in the microtiter plates, the experiment is incubated for a period of 24 hours. The chemicals’ cytotoxicity can be subsequently established using automatic image analysis of microscope pictures captured at the beginning and end of exposure. Subsequent to microscopy, substrates are also added to the cells to measure particular effects with the help of a plate reader. In future, we will therefore be able to analyse significantly more samples than before in the same timeframe, and thus also be involved in epidemiological studies and environmental-monitoring studies with a high spatial and temporal resolution. Through automation, we are also able to reduce the error rate and can carry out experiments more systematically. Escher is the initiator of the new CITEPro research platform. In the same efficient way and also as an alternative to animal testing, the way chemicals impact fish embryos in CITEPro could also be tested. With the help of vertebrate automated screening technology (VAST technology), features in fish embryos could be automatically examined. In doing so, the VAST system, after taking the embryos from a microplate, positions them in a capillary, thus allowing a camera to take high-resolution, or fluorescence, videos and images as needed. Image characteristics can be subsequently extracted as numbers using FishInspector—an open-source software created at UFZ. This allows investigators to obtain dose-response relationships. These are only two examples but they demonstrate that CITEPro is far more than a collection of hardware devices. It is based on the concept of analysing substances in the environment not substance by substance, but rather mixture by mixture, in order to record and describe substance mixing activities. Escher also emphasized that “such infrastructure is unique in the field of environmental sciences in Germany, and is rare in Europe.” She now intends to apply the novel platform to start other research co-operations in the coming days— nationally, internationally, and also within the UFZ, with both industry and research institutes.